Not only are automatic cat feeders a godsend for anyone who has ever been woken up at 4 am with incessant meowing for food, but they are also great for animal lovers who have cats with weight or health concerns which need to be fed several small portions throughout the day. If you have a pet that is anxious about food, these devices can also be a tremendous help to overcoming anxiety and the fear of not being fed. They are especially useful for busy working parents who spend long hours away from home and have to worry about getting home to feed their pet. Whatever your need there is no shortage of choice when looking for an automatic option for your cat, from the most basic units to feeders that incorporate the latest technology there are devices to help with every type feeding issue that pet owners face. Overview: This is a top-rated model on Amazon. It has excellent reviews, and most users find that it works well for their needs. It has an easy to program option that you can change without too much effort. It can hold a large amount of food (3 L) and is quite dependable. What do users love? Reviewers seem to like this product. They rave about the ease of use of this device as well as the large capacity of the Iseebiz. Possibly make it a little harder for cats to break into. The tray size is a little small for some users. Overview: This best-selling model is an excellent option if you are looking for peace of mind while you are away. The device also has a battery backup if the power goes out. Users love the removable tray that helps make it easy to clean. It is a machine that is pretty difficult for most animals to break into; it is also pretty sturdy. Some users had trouble with kibble getting caught in the chute. Overview: This device allows you to choose from 1 to 39 portions per meal, with about 12 g per 1 share, with up to 4 meals a day at any time. It has easy to remove parts for cleaning and fun-to-use voice recorder. It also has both battery or USB charge power options. It has infrared detection to overfeeding and overflowing. What do users love? The feeding schedule is very flexible, so you can customize it for your families needs, particularly the ability to feed minimal amounts. Many users commented that it is a very well-built device. The metal bowl can be a little loud when food drops. 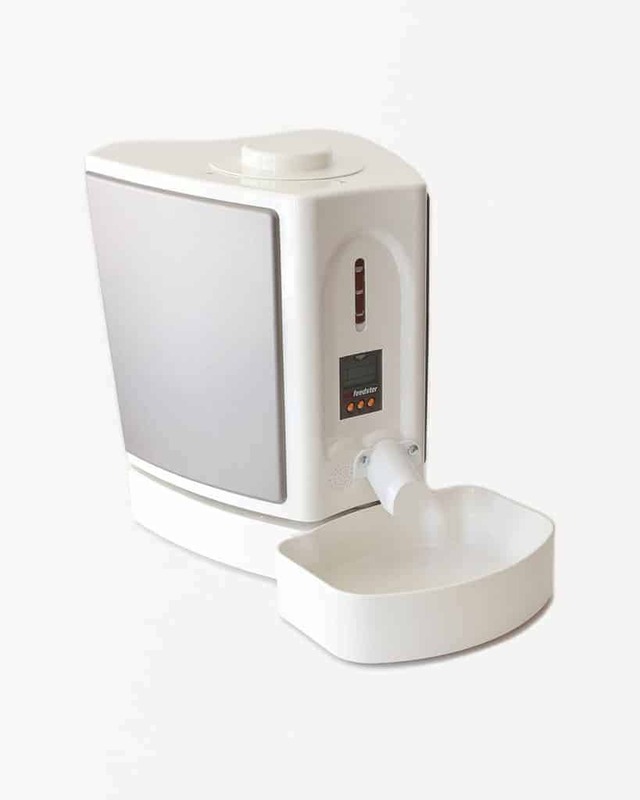 Overview: The Petsafe Healthy Pet is another excellent option if you are looking for a high-quality dispenser. By most accounts, it is well made and performs well with most dry food. It gives you the option to schedule up to 12 meals a day of portions from 1/8 of a cup up to 4 cups in a single serving. It also has a couple of cool modes including a slow feed mode and a pause feed mode that will stop the food temporarily. The kibble is dispensed by gravity, using a kind of conveyor-belt elevator, protected by a large plastic hood that is very reliable and seems well suited for different sizes of dry food. What do users love? Most users agree that this is a well-designed product that works great. 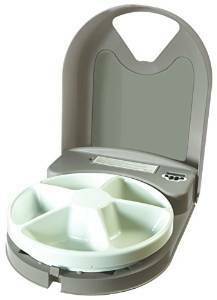 Similar to the Super Feeder, the Petsafe Healthy lets owners dispense exact amounts of food in multiple feedings. The majority of reviewers find it easy to program and quite flexible. The slow feed option is suitable for fast eaters; it helps to avoid any after effects of eating too quickly. Reviewers comment that the battery life is pretty good and they also like that it can be scheduled at asynchronous intervals (e.g., 4 AM, 5 AM, and 8 PM) as opposed to having feedings every 24, 12, 8, or 6 hours. What could be improved? It does not come with a power adapter (sold separately). Some users find the kibble hitting the metal bowl is too loud. There is also no warning indicator or light when the food is running low. Because it has such a large capacity, the unit is a little large and bulky. Plastic may cause acne for some cats. Overview: The Pet Feedster can serve up to 5 meals per day of any portion you choose. It is also reportedly ant proof if that is a problem that you have faced with other models. One of the best things about this unit uses AC adapter or 6 x “D” batteries, so if the power goes out, you have the battery backup, so you don’t have to worry about your furry friends not being fed. What do users love? It does appear to be cat proof; most are not able to reach the kibble through the discharge chute or knock over the feeder. The Pet Feedster works well both on AC and Battery. It holds the right amount of food and most reviewers report that setting up the feeding schedule is easy. Some users find this to be a great option if you are feeding multiple cats and need to be away for a couple of days ( because of the high-capacity + peace of mind having the battery backup). 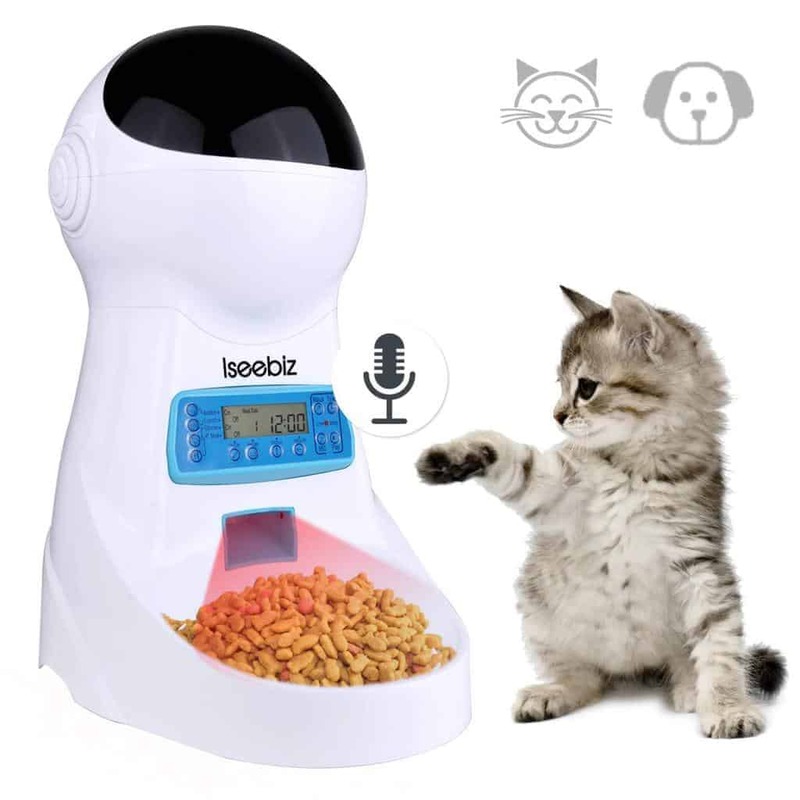 One other thing that many users like about the Pet Feedster are that the amounts of kibble dispensed are pretty accurate. What could be improved? The clock may run slow, and you might have to adjust it every month or so. Can be confusing to program, if you don’t keep the instructions. Some cats can break into this model. Plastic may cause cat acne. Overview: This is an excellent option if you want to space food out over the day. It has five compartments, and you will have to refill it more often than the models that have the large compartments that store a significant amount of food. It wouldn’t be a good feeder if you were looking to leave for a few days. 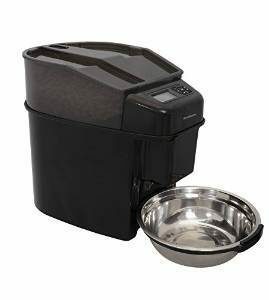 This model doesn’t have the flexibility of some other models, as the electronic timer allows you to set the times each new meal comes out in one-hour increments, and you can only program four feedings (not 5) because your pet has immediate access to the first bowl. It runs on 4 D-cell batteries (not included). What do users love about the Eatwell? The low price point is a significant plus for this model; some reviewer’s find that the features suit their needs very well, and there is no need to get the features of the more expensive models. The performance is also noted by many reviewers as being very good (as long as the tray is positioned correctly). What could be improved? If the batteries go dead, once you replace them, you need to reprogram the unit. You also need to ensure that when you remove the tray for cleaning, you have to position it correctly when you put it back on, or it won’t work correctly. There are two basic types of auto dispenser; one has a large hopper that allows you to fill with dry kibble and let it go for weeks before you have to refill it. The other type is a circular style that has 5 or 6 compartments that you will have to refill every 1-3 days depending on your feeding schedule. If you are looking for something for wet food, you will have to use a circular type model. Depending on your living arrangements you will most likely want to consider the size of any model that you may purchase. The models that hold the most kibble will be the largest; if you don’t have a lot of extra living space, you may want to stick to the circular flat style of feeder. There is quite a range of the number of times you can feed your feline using an automatic dispenser. Some units let you schedule up to 12 feeding per day, although 5 is a more standard option (especially on the circular models). If you are looking for a product that lets you do a very small or very large serving size (some go as small as a tablespoon of kibble) the option to adjust the feeding size is available on most products, although the accuracy of serving size can sometimes be an issue. These dispensers generally work best for dry kibble, but there are options if you are using wet food. 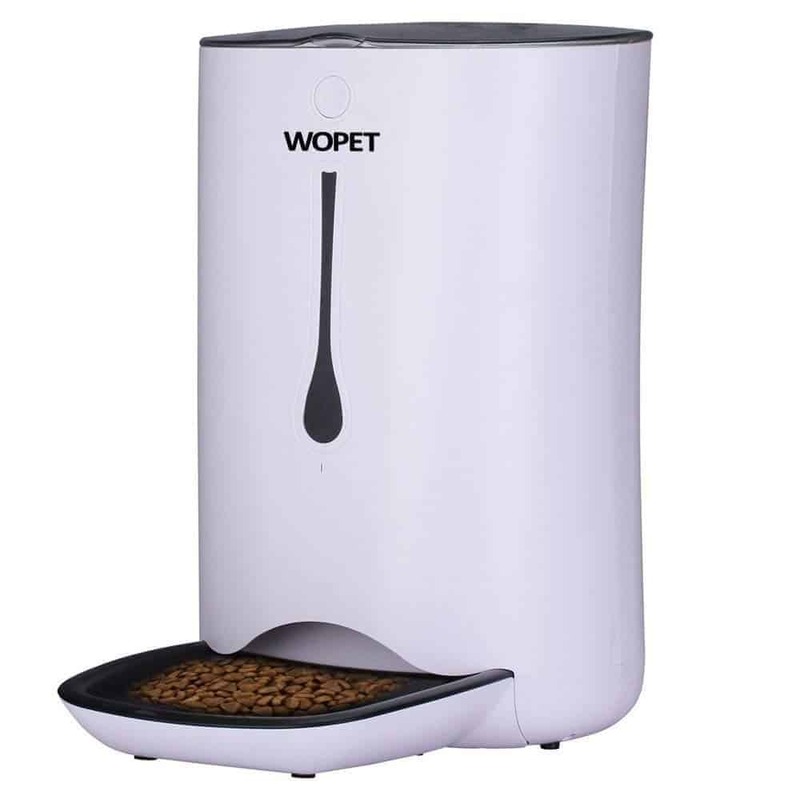 If you are looking for wet food dispenser, you can try Cat Mate C500. Auto dispensers run on battery power, AC adapter (you plug it in) or both. There are positives and negatives to both types. If it is battery-powered, you don’t have to worry about a power outage, although you do have to make sure your batteries don’t run out and leave your animals stranded with nothing to eat. If you go for a model that plugs in, you may be concerned that your pet may chew the cord or the power may go out, leaving them with no food. Most of the latest models have both power options for safety. Some users are looking for combo water and food dispenser. Generally, it is not recommended to put water into one of these devices, unless it states that you can use water as well as food with the design. It is best to get a separate automatic watering bowl to avoid any damage to the device. If you are looking for help for animals on prescription diets or weight management programs, you may want to look at SureFeed Microchip Feeder. It ensures that only the designated pets access just their food, you can use it for multiple animals as it can store up to 32 memory microchip identifiers. Many of the newer companies are using some of the best wireless and smartphone technology to allow users to stay connected to their pets and let you control the device from your phones. For some users, it can provide a bit more peace of mind controlling the feeds from a smartphone. Check out the Petnet SmartFeeder if you are interested in this type. Cat food bowls are generally ceramic, stainless steel or plastic. Ceramic doesn’t tend to work well in auto dispensers because of the weight, so most use a stainless steel or plastic bowl. Stainless steel is a good option, although some users find the kibble dropping into the container can be loud enough to wake the owner up. Plastic is the other option and is okay if it is BPA free and is a safe plastic to use with cats. Some plastic cause cats to develop acne, which is as unappealing as it sounds. Felines are smart creatures and have a lot of free time on their hands. Many make it their mission to figure out exactly how to break into the supply of food. Most will only get a bit of kibble, but some go so far as to knock the unit over the unit or shake it until kibble falls out. If you have a furry friend who is a bit of a burglar, you may have to spend a bit more money to get something that they aren’t able to break into. If you are interested in one of the larger capacity models that can store a few weeks’ worth of kibble, a handy feature to have for this style is a low food indicator as well as a low battery indicator( if it is running on batteries). These are pretty essential features to have to avoid your cat from accidentally going without anything to eat. The unit jamming and nothing gets out. This problem tends to be solved by changing the food type or making sure you aren’t overfilling the hopper. Pets breaking into or moving the trays to access more food is another pretty common issue that kind of defeats the purpose of the product. Not being reliable and giving the food when it isn’t supposed to. 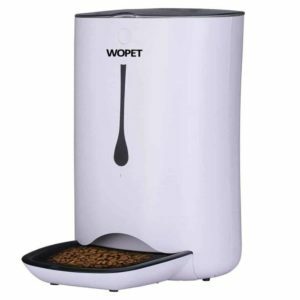 If you are using a dispenser for wet food, you will want to look for devices that keep the wet food fresh so it doesn’t go hard in the way that it would if it is just sitting in a dish over many hours. Unfortunately, the return policies on most of the feeders on the market are not the best. Generally companies won’t accept returns on these types of products due to health and safety reasons. If the product is defective and doesn’t work, you will most likely be able to return it, but if it turns out that you have used it and found that wasn’t quite what you wanted, there is a good chance you won’t be able to return it. Make sure you do your research before purchasing. You will want to ensure you check over the warranty of any products you are interested in purchasing. Most of the companies offer a one limited manufacturer warranty. Since some models cost well over $100, you should be familiar with what the warranty will cover (defects in workmanship and material) and make sure that you are only using it for its intended purchase (i.e., don’t use an indoor device outside). 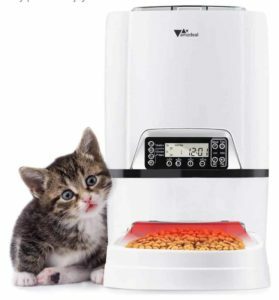 How long can you leave cats if you are using an automatic feeder? If you are leaving your feline alone for more than a couple of days, it would be best not to rely on an auto dispenser, in case it should fail or something unexpected happens. If you have no choice but to leave for more than a few days, there are a couple of things that you can do to ensure the safety of your cat. One is to install a camera focused on the dispenser, so you can tell if it isn’t working correctly. If you see a problem, you can have someone come and check in. The other thing that you can do is have two feeders programmed to go off at alternate times, so if one fails you will at least have the backup to prevent your cat from going without anything to eat for too long of a period. These machines aren’t designed to let you leave your pet home alone unsupervised for extended periods, so you really shouldn’t rely on them for more than a couple of days. A common problem, if you have more than one pet, is the dominant personality eating all of the food, while the grazer or submissive animal will go hungry. If you are facing this type of situation, you may want to have a look at the SureFeed Microchip Pet Feeder that reads the microchip and only gives the set amount of food for that day. Auto Feeders are a great help to owners struggling with many different food-related issues. Not only do they help people get more sleep, but they may also help with feeding anxiety problems, dietary issues, help with dispensing medicine and they give owners peace of mind when they are away from home and are unable to feed their pets. There are a lot of great, innovative products on the market for a wide range of budgets that can help improve life with your cat. As long as you supervise and test your feeder on a daily or weekly basis, they are much more convenient than hand-feeding but be aware that they do require some level of monitoring to ensure that your cat is fed when they are supposed to be.